Integrating renewable energy and other distributed energy sources into smart grids, often via power inverters, is arguably the largest “new frontier” for smart grid advancements. Inverters should be controlled properly so that their integration does not jeopardize the stability and performance of power systems and a solid technical backbone is formed to facilitate other functions and services of smart grids. This unique reference offers systematic treatment of important control problems in power inverters, and different general converter theories. 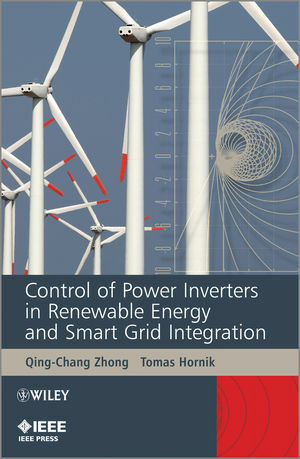 Starting at a basic level, it presents conventional power conversion methodologies and then ‘non-conventional’ methods, with a highly accessible summary of the latest developments in power inverters as well as insight into the grid connection of renewable power. Consisting of four parts – Power Quality Control, Neutral Line Provision, Power Flow Control, and Synchronisation – this book fully demonstrates the integration of control and power electronics. Qing-Chang Zhong received his Diploma in electrical engineering from Hunan Institute of Engineering, Xiangtan, China, in 1990, his MSc degree in electrical engineering from Hunan University, Changsha, China, in 1997, his PhD degree in control theory and engineering from Shanghai Jiao Tong University, Shanghai, China, in 1999, and his PhD degree in control and power engineering (awarded the Best Doctoral Thesis Prize) from Imperial College London, London, UK, in 2004, respectively. He holds the Chair Professor in Control and Systems Engineering at the Department of Automatic Control and Systems Engineering, The University of Sheffield, UK. He has worked at Hunan Institute of Engineering, Xiangtan, China; Technion¨CIsrael Institute of Technology, Haifa, Israel; Imperial College London, London, UK; University of Glamorgan, Cardiff, UK; The University of Liverpool, Liverpool, UK; and Loughborough University, Leicestershire, UK. He has been on sabbatical at the Cymer Center for Control Systems and Dynamics (CCSD), University of California, San Diego, USA; and the Center for Power Electronics Systems (CPES), Virginia Tech, Blacksburg, USA. He is the author or co-author of Robust Control of Time-Delay Systems (Springer-Verlag, 2006), Control of Integral Processes with Dead Time (Springer-Verlag, 2010) and Control of Power Inverters in Renewable Energy and Smart Grid Integration (Wiley-IEEE Press, 2013). His research focuses on advanced control theory and applications, including power electronics, renewable energy and smart grid integration, electric drives and electric vehicles, robust and H-infinity control, time-delay systems and process control. He is a Specialist recognised by the State Grid Corporation of China (SGCC), a Fellow of the Institution of Engineering and Technology (IET), a Senior Member of IEEE, the Vice-Chair of IFAC TC 6.3 (Power and Energy Systems) responsible for the Working Group on Power Electronics and was a Senior Research Fellow of the Royal Academy of Engineering/Leverhulme Trust, UK (2009¨C2010). He serves as an Associate Editor for IEEE Transactions on Power Electronics and the Conference Editorial Board of the IEEE Control Systems Society. Tomas Hornik received a Diploma in Electrical Engineering in 1991 from the Technical CollegeVUzlabine, Prague, the BEng and PhD degree in electrical engineering and electronics from The University of Liverpool, UK, in 2007 and 2010, respectively. He was a postdoctoral researcher at the same university from 2010 to 2011. He joined Turbo Power Systems as a Control Engineer in 2011. His research interests cover power electronics, advanced control theory and DSP-based control applications. He had more than ten years working experience in industry as a system engineer responsible for commissioning and software design in power generation and distribution, control systems for central heating and building management. He is a member of the IEEE and the IET.